On my recent explorations of the North, I exchanged SatNav Woman for my Mum and a map. It’s a swings and drive several times around the roundabout looking for the right exit approach. SatNav Woman doesn’t get excited by finding places like ‘Gallows Green’ on the map or stopping to ask directions from bonny locals who call you ‘Me Duck’ (ok, that was both of us), but then she doesn’t send you text messages from the car when you’re having a moment with a thousand year old font or leave her wet socks to dry on the dashboard either. From Croxden Abbey we headed to Mayfield, and specifically, Church Mayfield as I wanted to see the early sixteenth century tower at St John the Baptist. Completed by Thomas Rollestone in 1515, he added the inscription ‘Ainsi et mieux peut etre’. I don’t speak French but I understand this translates to something like ‘thus it is and better it could be’ and appears to be a variation on the Rollestone family motto. 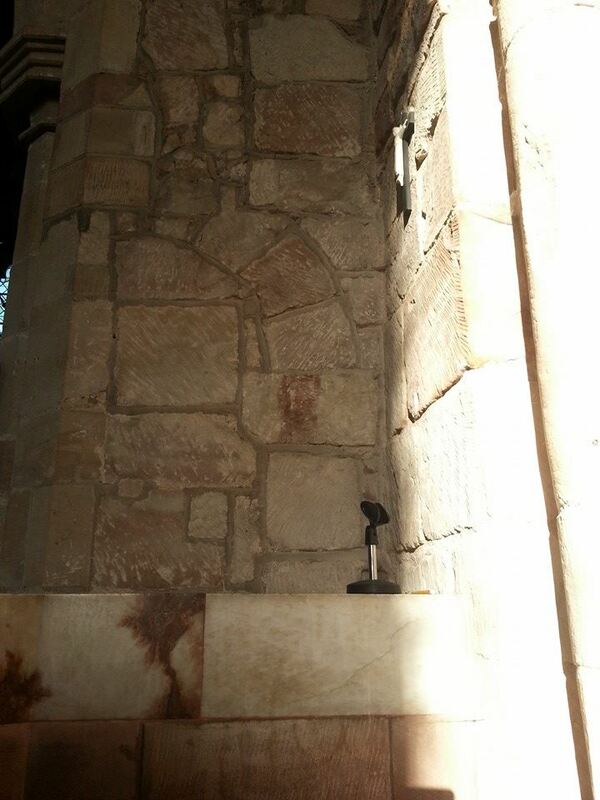 Some have interpreted this as an indication that Thomas thought he could have done a bit of a better job on the tower. My maths is as bad as my French, but I can just about work out that this year was its 500th anniversary and at the celebrations in April, someone made an edible replica of the church in gingerbread, something so brilliant that surely neither perfectionist Thomas Rollestone nor Mary Berry could find fault. The door to the tower is peppered with holes and the story goes that on 7th December 1745 the retreating army of Bonnie Prince Charlie passed through Mayfield, murdering an innkeeper and a man who refused to hand over his horse before turning their muskets on the church door, behind which the terrified villagers had barricaded themselves. Although I came in peace, the door was also locked to me and so I had to be content exploring the churchyard. Underneath a yew tree there’s a medieval wayside cross moved here in the mid nineteenth century from Middle Mayfield, where it stood at a junction opposite a house known as ‘The Hermitage’ (an inscription on the door lintel reads ‘William Bott, in his old age, built himself a hermitage 1749). Something else in the churchyard which I’ve never seen before but is so simple and effective that I’m not sure why, is a tree stump timeline, marking events in the church, village and the world during the lifetime of the Lebanese cedar which was one hundred and seventy seven years old when it was felled in 2008. En-route to our next destination (Cheadle), we tried and failed to find the Hanging Bridge, spanning the River Dove, and also the Staffordshire/Derbyshire boundary. It was rebuilt in 1937 but, as you’ll see from the photo I’ve pinched from elsewhere, the arches of the original fourteenth century packhorse bridge are still visible. The name is said to refer to the executions of the Jacobite rebels which took place here following the trouble at Mayfield. However, as much as I’m a fan of folklore, I’m also a lover of linguistics and my suspicion the story was derived from the bridge’s name, and not vice versa, was confirmed by David Horovitz’s epic research into the place names of Staffordshire which reveals that the structure was first recorded as Le Hongindebrugge in 1296, nearly 450 years before Bonnie Prince Charlie’s troops are said to have met their end here. Of course that only raises more questions about what ‘hanging’ actually refers to here. I’ve been thinking about it for over an hour and now I’m handing it over to you, as the best I can come up with is a rope bridge. Ainsi et mieux peut etre…. I was still feeling the effects of the lunar eclipse in the early hours of Monday on Tuesday morning. Not in a spiritual way, I was just knackered from staying up. However Croxden, the first stop on my rambles around the North of the shire last week, was a sight for my sore eyes. The tiny village is dominated by the ruins of a Cistercian Abbey founded in 1176 by Bertram de Verdun of Alton Castle (1) for the souls of his predecessors and successors. Remains of 12thc Alton Castle founded by Bertram de Verdun. What is left of the semi-circular East end of the abbey church, unusual in England and probably inspired by the French designs the Abbey’s patrons would have known, lies to one side of the road that someone decided to cut through the site. The nave, south transept and other monastic buildings lie on the other and you can see a plan showing what is still visible above ground and what has been lost here. In 1288, a priest from Walsall called William de Schepisheved, was given the task of chronicling life inside and out of these Abbey walls. He worked backwards to 1066 and contemporaneously until 1320 when the entries in his hand stop, although the chronicle continues until 1374. We tweeted and shared our photos of the lunar eclipse. William the Chronicler recorded the celestial events he witnessed in the annals. Understandably for him and those of his time, eclipses were considered bad omens, often linked to any conflict, pestilence or bad weather that occurred. William records a solar eclipse in July 1330 and connects it to the floods and unseasonable weather which occurred two months before and for three months after, resulting in a late harvest, “…they had scarcely reaped the last of their corn with the greatest toil on the feast of All Saints and they had at last collected their peas into barns and outhouses on the feast of the blessed apostle Andrew. And what is so remarkable to see and hear, on the feast of All Saints and of St Martin fresh peas in their shells were given to the convent in the refectory instead of pears and apples”. Another notable event in July 1301 appears in the Abbey’s annals describing how, “on the day of the Blessed Mary Magdalene, about the sixth hour, a great earthquake took place, to such an extent that all the persons in the convent, being at their first refection, were dismayed with a sudden and unlooked-for trembling”. The chronicle also documents a connection between the abbey and Lichfield. William recorded that on Easter Eve in 1313, the great bell of the Monastery was broken by mischance and a man called Henry Michel came from Lichfield with his youths to cast another. It was reported that his first attempt failed but he started afresh and completed by the Festival of All Saints. It seems likely that this was Henry the Bellfounder who granted Lichfield’s Franciscan Friars the springs near Aldershawe which would later supply water to the whole of the city. Plaque on Lichfield’s Clock Tower, the base of which was once the water conduit which stood near the Friary. As well as life at the abbey, Death inevitably also features in the chronicle. There are the descriptions of the burials of the Verdun family including that of Lady Joan Furnival, eldest daughter and heir of Theobald de Verdun, who on October 2nd 1334, “was taken by untimely death in childbirth; for on the day she died she was only thirty years and almost two months” and was “buried near her ancestors between Lord Nicholas de Verdun, son of the founder, and her ancestor and Lord John de Verdun, her great-grandfather”. Their now empty stone coffins can be seen alongside the ruins at the east end of the church. The entry for 1349 simply and bleakly says, ” There was a great pestilence throughout the whole world.” Nothing more. No indication of how many succumbed to and how many survived the plague here in Croxden. The following year, 1350, another single sentence notes, “This year was a jubilee” (2), and then there is nothing until the harrowing entry made in 1361 which records, ” A second pestilence took place, and all the children that were born since the first pestilence died.” In the absence of detail, I did a little reading between the lines. After ten years, plague had reared its ugly head again and although overall mortality rates were lower than in the first outbreak, the disproportionate number of deaths amongst the young in this second wave led to it being known as ‘the Children’s Plague’. Was this was because those who had survived the plague the first time around had some sort of immunity that the children born subsequently did not? I don’t know. I’m not sure that anyone does for sure. In 1369, another ‘visitation’ is recorded. Five years later the Chronicle ends but not before recording two further natural disasters affecting the Abbey – a flood destroying all the grass growing near the water together with all the bridges across the River Churnet, and a tempest which took the lead off the dormitory, infirmary, and abbot’s chamber, throwing down half the trees in the orchard. Plague and poor harvests took their toll and by the end of the fourteenth century, the Abbey was in decline. One thing that doesn’t seem to appear in the Chronicle is the ‘fact’ that King John’s Heart is buried at Croxden. Possibly because it isn’t. I first came across the claim in Arthur Mee’s guide to Staffordshire and since have found several other sources saying the same, including William White’s Directory of Staffordshire (1851), Samuel Lewis’ Topical Directory of England (1831) and The Gentleman’s Magazine (1823). Trouble is other, more reliable sources say it’s at Croxton, Leicestershire including the Charter Roll of 1257. I’m sorry to say, I think we have to concede this one to our foxy neighbours. The King’s bowels were also said to have been removed at the time of his death and buried somewhere in Croxton, and to quote Simon Schama, their removal left John, ‘as gutless in death as he was said to have been in life’. 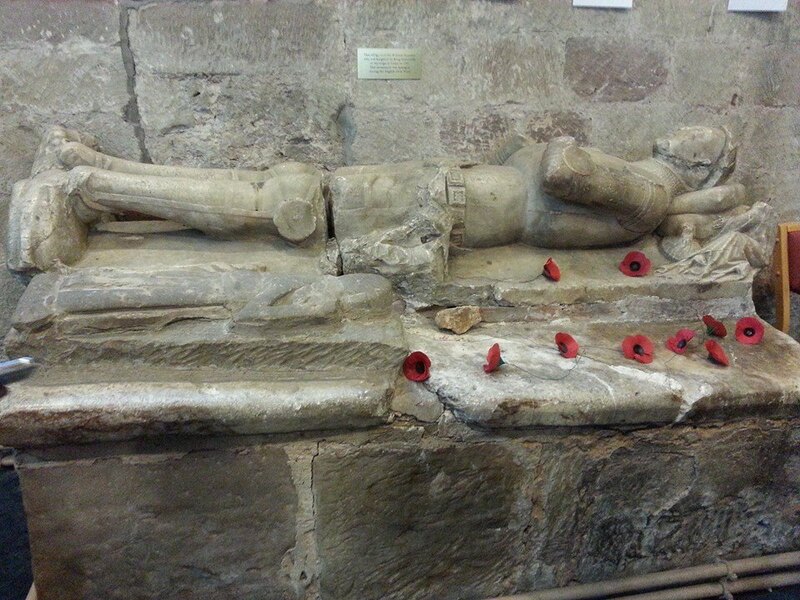 The majority of John’s body rests in Worcester Cathedral, although more in pieces than at peace. When the tomb was opened in 1797, it became apparent that the bones had been disturbed, with the jaw lying by an elbow and all but four of the teeth and most of the finger bones missing – the King’s hands presumably having fallen into the hands of souvenir hunters. The end of the road for Croxden came on 7 September 1538 when Dr. Thomas Leigh and William Cavendish received the surrender of the abbey and the roof was removed to prevent the Abbot and resident six monks from continuing to use the site. Although Croxden Abbey has been privately owned since then, it has been under state guardianship since 1936. Today, the ruins are cared for by English Heritage and it’s absolutely free to go and explore them (although I’m sure they’d appreciate a donation). Unlike staying up all night to watch a lunar eclipse, I can highly recommend it. More information on visiting and directions here. (1) I had no idea there was a castle at Alton until I went to Alton with a friend and saw a sign for it. As we found out, it is not open to the public. (2) I suspected that a jubilee in this context did not mean what I thought it did so I of course googled it and discovered that jubilee years had been started by Pope Boniface in 1300, and to be celebrated every hundred years thereafter. However, Pope Clement VI later amended this as people’s average lifespan was too short and so many would not live to see one. Plus there was money to be made from pilgrims. Pope Paul II later amended the frequency of jubilee years to be every twenty five. For anyone interested, the next one will be in 2025. CROXDEN ABBEY: ITS HISTORY AND ARCHITECTURAL FEATURES. Wall, located just two miles to the south of Lichfield, is an incredible place to visit at anytime of the year. This Sunday (19th July) however, the Friends of Letocetum will be bringing the remains of the Roman settlement here to life with their annual open day, held in conjunction with English Heritage and the National Trust. 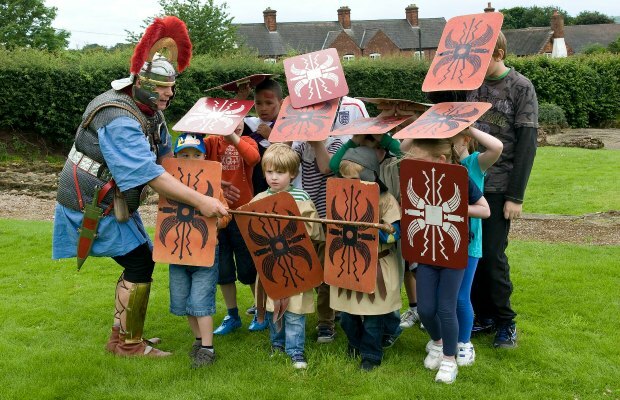 Entrance is free and the event runs from 11am to 4pm, during which time you’ll be able to experience life as a Roman soldier, get creative with a Roman artist and explore what everyday life would have been like at Letocetum. A group of Saxons are also setting up an encampment at the site and for literature fans there will be a Saxon book binder and storyteller. Children can take part in a range of games and activities* and there will also be a stall selling Roman games, perfumes and beads. John Crowe, chair of the Friends group and Wall Parish Council said, “Last year we welcomed over twelve hundred visitors. The whole village comes together each year for our annual open day, and we want people to come along and have fun, whilst learning more about the significance of this major Roman settlement, situated at the crossroads of two of the most important roads at the centre of Roman Britain. The Staffordshire Hoard was discovered just one mile to the west of the village, and other finds from the local area suggest that Christianity may have been established at Letocetum prior to St Chad’s arrival in Lichfield”. 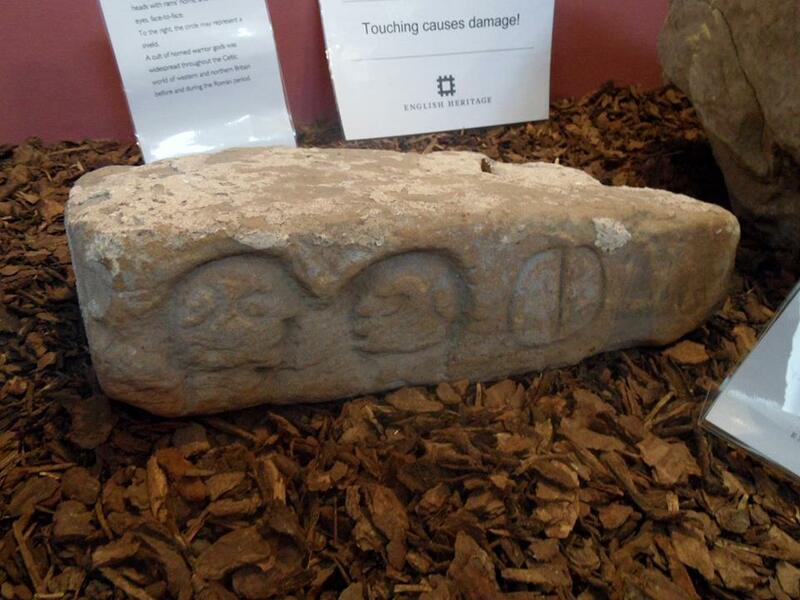 This stone, one of several found built into one of the walls at Wall, is just one of the many fascinating artefacts on display at the museum. It is thought to be Romano-British and features two carved heads with horns and what has been interpreted as a shield. 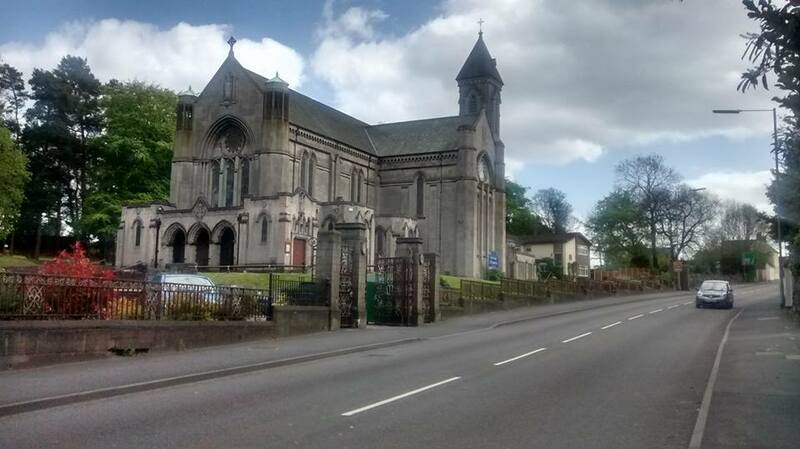 “The church of St John, built in 1837 and designed by William Moffatt and George Gilbert Scott, will be open to visitors, and refreshments will be available in the village hall. There will also be volunteers on hand in the museum to talk visitors through the fascinating collection of artefacts discovered at the site, so please do come and join us for what will be an enjoyable and informative day”. 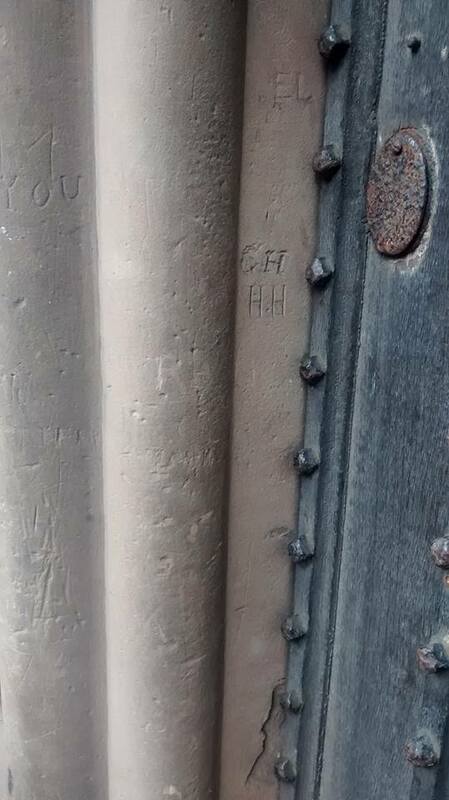 I had an hour to kill down in Lichfield and it suddenly occurred to me that I’d never looked to see if there was any graffiti, medieval or otherwise, on or in Lichfield Cathedral. 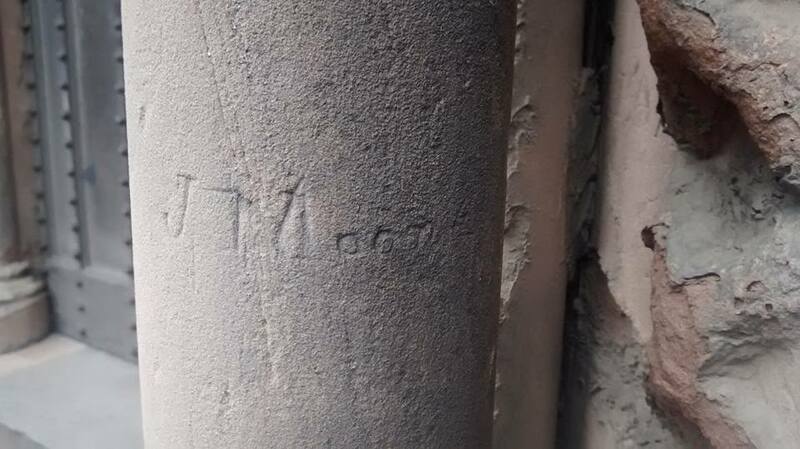 The exterior of the south door turned out to be a rich source of names and initials, some dating back to the mid-eighteenth century. Nearby there’s a daisy wheel, a compass drawn symbol which appears in churches, but also in secular buildings, all over the country. There’s a lovely and much clearer example up the road at All Saints Church in Kings Bromley. Although some believe daisy wheels were used by masons for practical purposes, the general consensus is that most of them were intended to be ritual protection marks. 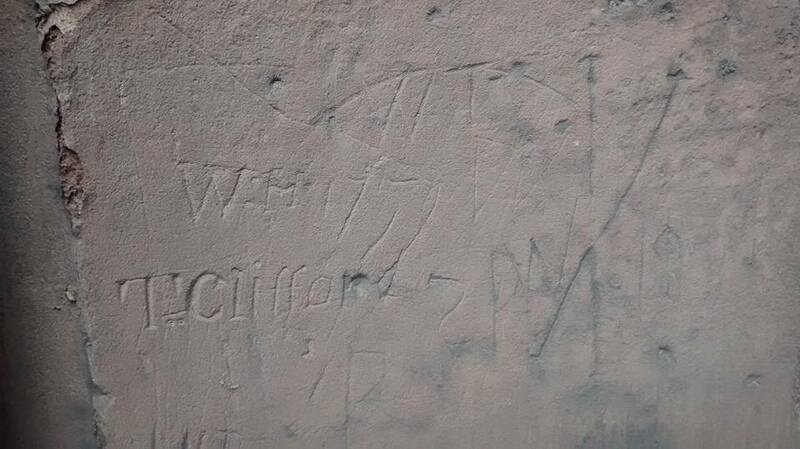 Our Lichfield Cathedral example is faint, and as you can see, barely visible on the photograph. Far better to go and take a look yourself (and try to spot some more graffiti whilst you are there of course!). As well as being a graffiti magnet, the Cathedral also seems to attract bees. I remember last year, Denise Peters took a photo of a swarm of honey bees in The Close for day sixty one of our one hundred days in Lichfield project and there was of course the masonry bees eating the Cathedral drama of 2008. 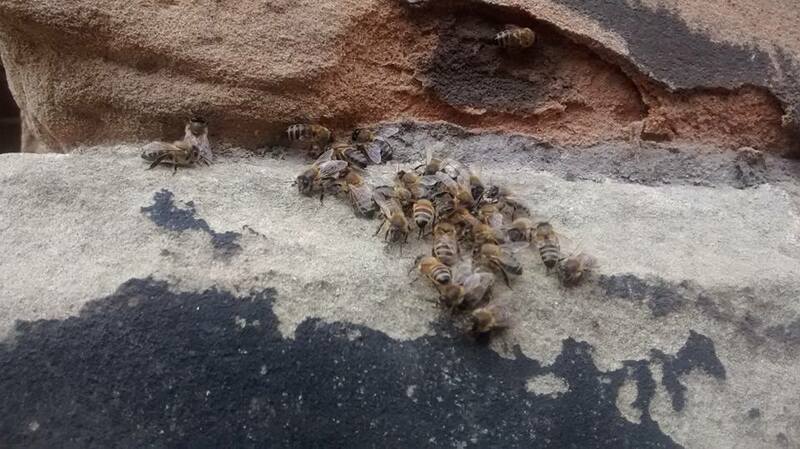 I am assured that the two dozen or so I saw this afternoon are of the honey rather than masonry variety. Perhaps they were there looking for daisies too? At the end of a long week of exams, assignments and driving backwards and forwards to Wolverhampton, I needed to refresh my tired eyes and mind. Others in my situation may have headed for a spa but I headed for Lichfield bus station. The plan was to jump on the first bus that came, get off a certain number of stops later, and to explore wherever it was that I ended up. 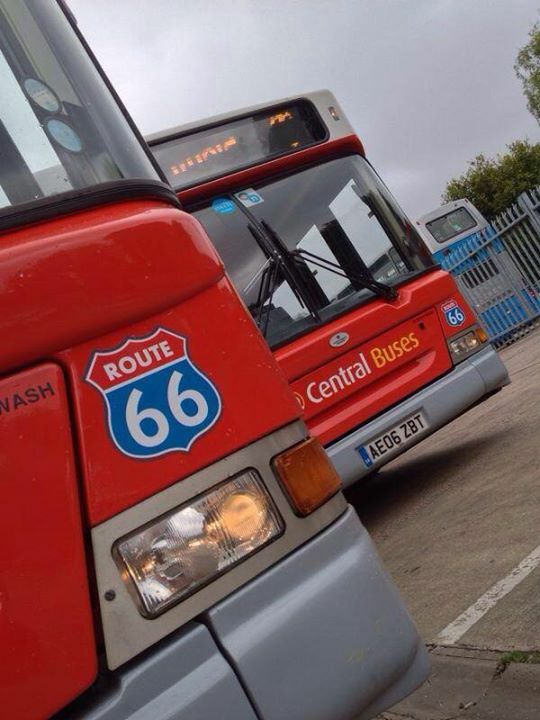 The first bus to turn up was for Route 66 and, as I was in a fatalistic kind of mood, I took this as a good omen. However, the driver was reluctant to let me buy a day ticket, pointing out that not only did the bus only go as far as Burntwood, it stopped running about 4 o’clock. Not quite the epic journey I was hoping for, so I took his advice and decided to get my kicks on Route 62 instead. It winds from Lichfield to Cannock. More than eleven miles all the way. Well it goes past Sandyway, Pipehill and Boney Hay. And Cannock Wood looked oh so good. Plus you can change at the bus station for Tamworth. All for £6.20. I had planned to get off after an arbitrary ten stops but I was enjoying looking out of a window rather than at a screen so much, I stayed on the bus for an hour. As the clock struck two we arrived in Hednesford. 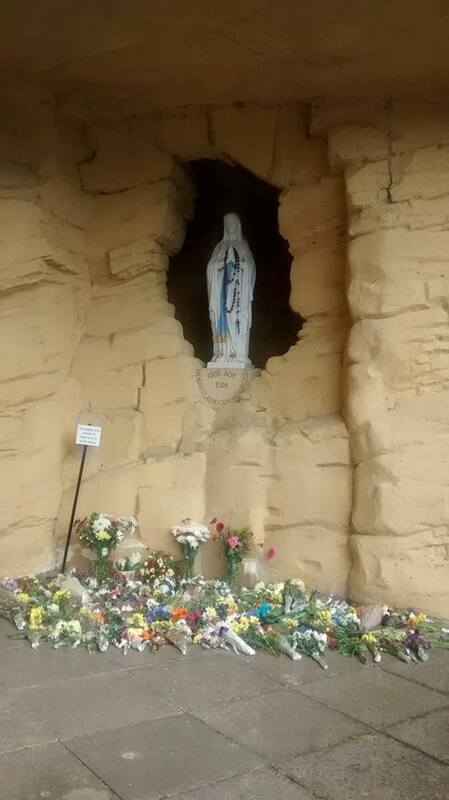 On first sight, you’d be forgiven for thinking that you’d been miraculously transported to Lourdes instead. Hednesford’s first Roman Catholic priest, Dr Patrick Boyle, made frequent pilgrimages to the shrine in France. 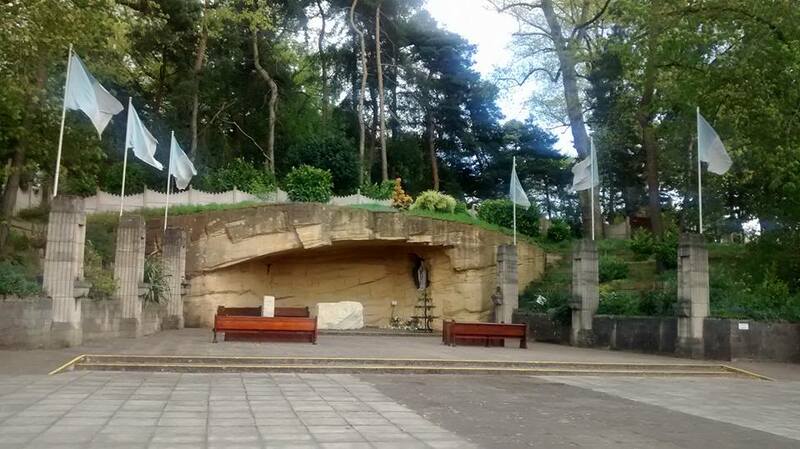 Concious that many in the Diocese hadn’t a prayer of being able to visit themselves, he conceived the idea of bringing the experience of Lourdes to them but died long before the thirteenth century style church and replica grotto were completed in 1934. Due to mining subsidence in the area, the concrete church is built on an adjustable concrete raft. Standing alone in the grotto, all I saw was an architectural curiosity, although the floral offerings hint at how much more this place is to others. Perhaps, if I were to come back in July to join the nine hundred or so pilgrims from across the Archdiocese of Birmingham, or in August for the annual Polish rally, which at one point attracted almost ten thousand people (1), I too would see it in a different light. For now though, back on the bus and to Cannock and something I feel much less guilty about labelling an architectural curiosity. Meet Khushi. Khushi the elephant is a replacement for the vandalised Canumbo (a.k.a Nocky), a fibreglass elephant commissioned by WH Smith Do-it-All in 1989. No-one seems to know why. Was it inspired by Walsall’s infamous hippo I wonder? 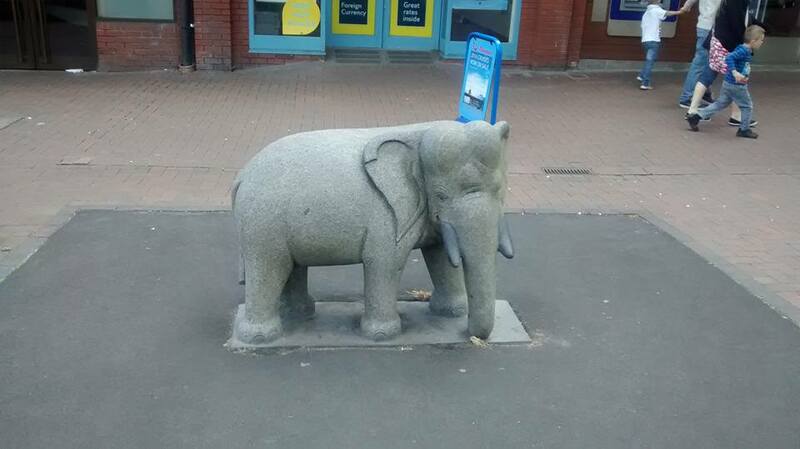 A lady sitting nearby didn’t know either, but she said she thought she knew of a rhinoceros statue in Birmingham. It turned out she was in fact thinking of the Bullring Bull but she did make me wonder what other beasts are lurking out there? I’ve started to draw up a list, and it’s a work in progress, but so far, in Staffordshire alone, we have a surprised looking white cow on a flying carpet, a lion in a pensive mood, a panther influenced by the geometric forms of Cubism and a bronze stag and hind, won by a woman from Cannock on the Price is Right and donated to the High Court shopping centre in Cannock. Forget the road trip, next time we’re going on safari (2). 1) The rally was established in August 1948 by Father Mieczyslaw Bossowski, who I believe came to England with the II Corps at the end of the Second World war and became the resident priest at the Wheaton Aston Polish Resettlement Camp. 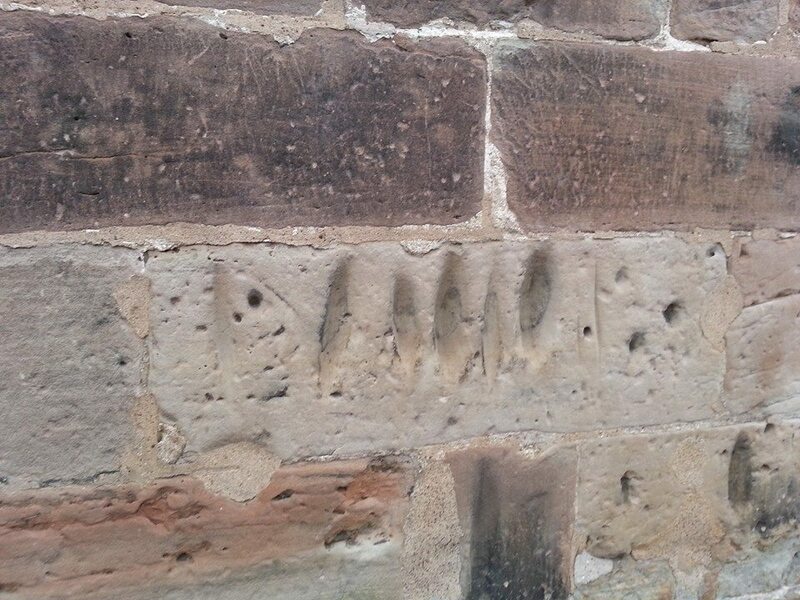 (2) That one is especially for you Matt R.
Without wishing to state the obvious, this blog is called Lichfield Lore. Sometimes I’m worried that I might go too far (in a geographical rather than controversial sense) but although I’ve overstepped the Lichfield boundary from time to time, I have at least remained in Staffordshire. Until now. 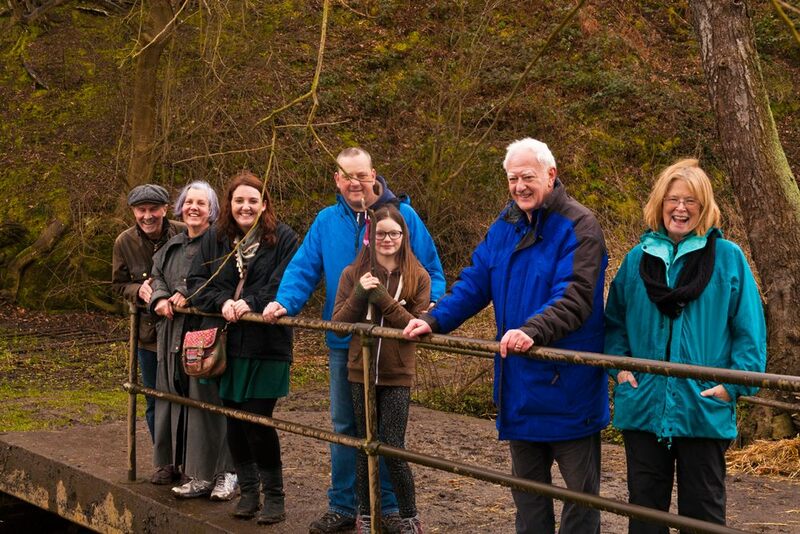 Last month, a group of us from Lichfield Discovered, crossed the border into Derbyshire to visit Repton which, between the seventh and ninth centuries, had been one of the main residences of of the Mercian royal family. In 653AD, Peada, son of the pagan King Penda converted to Christianity in order to marry Alhflæd (sp? ), the daughter of King Oswy of Northumbria. To help him to convert the rest of the kingdom, he employed four monks from Lindisfarne – Adda, Betti, Cedd and Diuma, the latter of whom would become the first Bishop of Mercia (1). However, Peada and Alhflæd do not appear to have been a match made in Heaven nor Neorxnawang. The Venerable Bede reported in his Historia Ecclesiastica that Peada was murdered in 656AD “wickedly killed by the treachery, as is said, of his wife during the very time of celebrating Easter”. Rather fitting then that it was death which brought us to the ‘cradle of Christianity in the Midlands’. 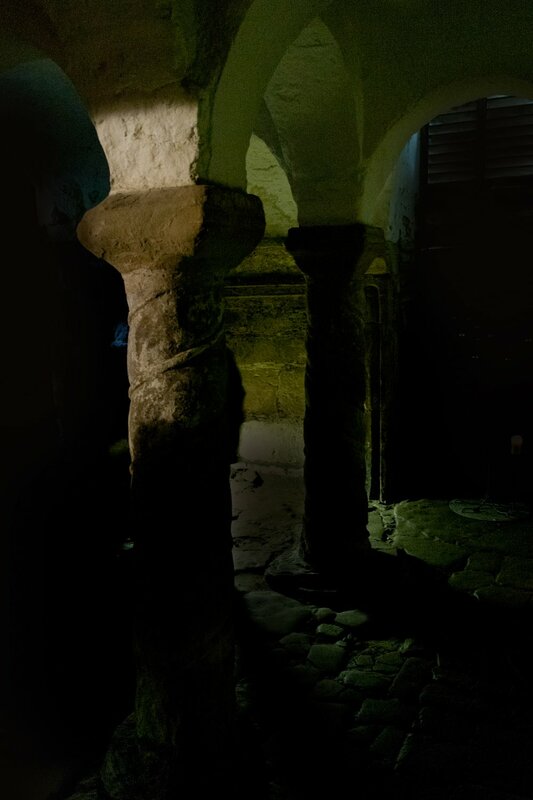 Although Peada is not buried here, the eighth century Anglo-Saxon crypt beneath the church was used as a mausoleum for later members of the Mercian royal family, including King Æthelbald ( ‘treacherously murdered at night by his own bodyguards’ says Bede), King Wiglaf (cause of death unknown) and his grandson Wigstan (murdered by a family member, who he objected to marrying his widowed mother. Seems his concerns were well-founded). The exact place where Wigstan was scalped is not known (Wistow in Leicestershire and Wistanstow in Shropshire both have claims) but wherever it was, it’s said that on the anniversary of his death each year, human hair grows from the earth at the spot where his blood was spilt (2). This supposed phenomenon and other miracles, led to the canonization of Wigstan, who became known as St Wystan. The crypt became a place of pilgrimage and the church above it took his name. The crypt at Repton. Photo by David Moore. In the early eleventh century, King Cnut ordered the holy bones to be moved to Evesham Abbey and in the centuries which followed, the entrances to the crypt were sealed and its existence forgotten until 1779, when someone digging a grave for the headmaster of Repton School broke through the vaulting and fell into it. We made our entrance in a rather more conventional way. 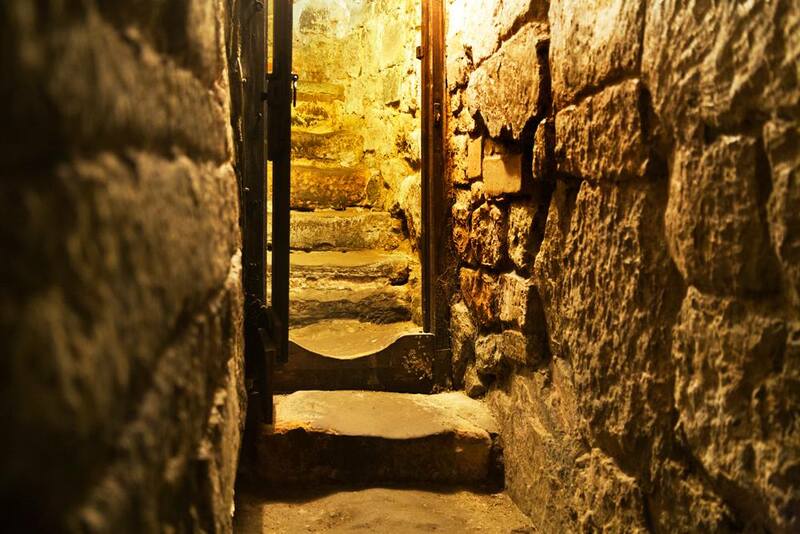 Down to the crypt and into the eighth century. Photo by David Moore. 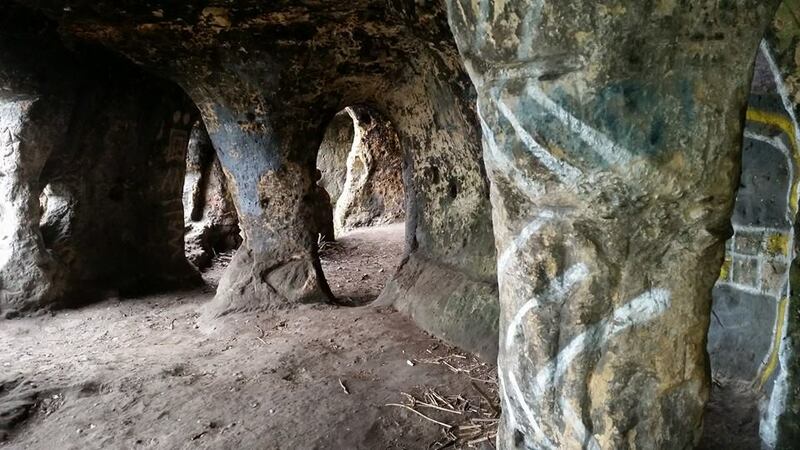 From Repton, we headed to the Anchor Church, four connected caves alongside the River Trent, which both nature and humans had a hand in forming. I confess that the time I should have spent on the logistics of the trip was instead spent at the Whippet Inn, and so it took a bit of finding with just a postcode to guide us. However, when we did finally arrive we were pleased to see that, although thick with mud, the often flooded path that would take us to the ‘church’ was just about passable. Inside the caves. Photo by Andy Walker. Legend has it that in the sixth or seventh century, the caves were occupied by a hermit, who spent his time here going to the river to pray. Later, the caves were supposedly inhabited by a monk called Bernard who spent his last days here, repenting for his part in the deception which persuaded returning crusader Hugh de Burdett that his wife Johanne had been unfaithful. The story goes that Hugh cut off her left hand, leaving her to bleed to death over the altar cloth she’d been embroidering for him using her own hair (what’s with the hair obsession around here?). 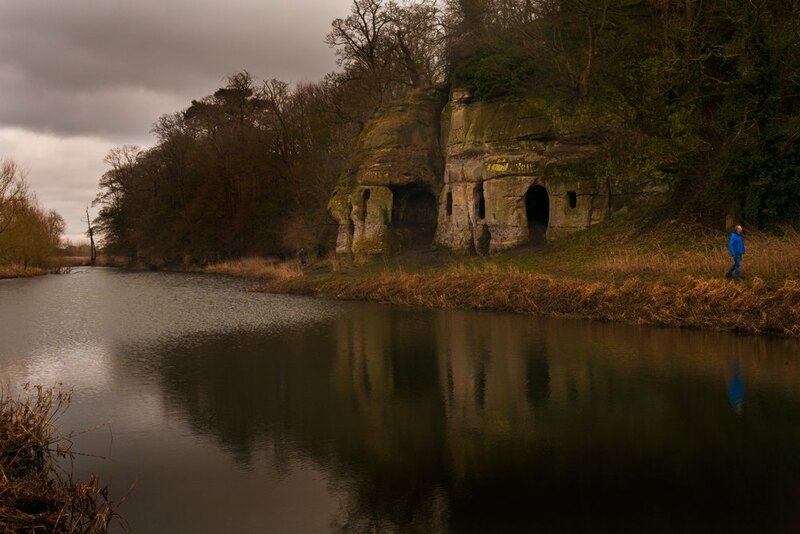 On a more cheerful note, in the eighteenth century, Sir Francis Burdett (presumably one of Hugh’s descendants) used the caves and riverbanks as a venue for picnics, as shall we when we visit again in the Summer. The Anchor Church near Ingleby. Photo by David Moore. On our way back to the cars, there was a blood-curdling scream. Had one of our party met with the ghost of Johanne searching for her lost hand or had they lost their footing and fallen victim to the mud? No, Carol just had something in her shoe. One of those funny at the time but you really had to be there moments admittedly, but I mention it because this is what I remember first and most fondly when I think of our trip. I love places for their stories and their connections to the people of the past, but even more so for the memories made by visiting them with people in the here and now. Looking for pirahanas in the River Trent. Photo by David Moore. 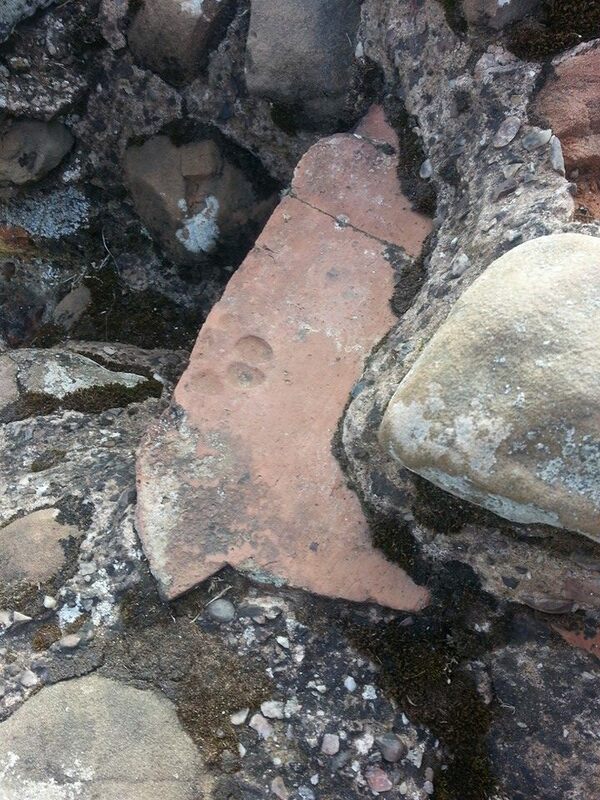 (2) There’s another Lichfield Discovered trip right there. Who is free on the first of June? We’ll have to split up though, gang…. 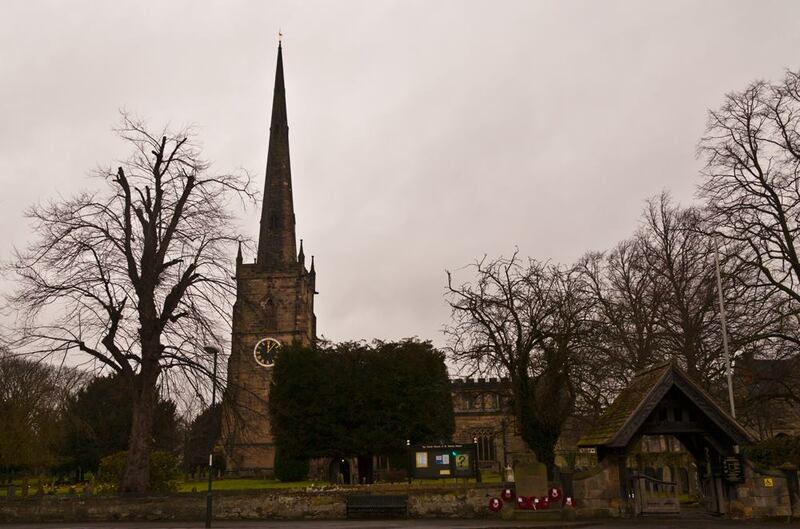 (3) Another Lichfield link – in 1364 an armed mob at Repton attacked the Bishop of Lichfield and the Prior. Actually, finding places with a tenuous link to Lichfield could be a whole blog post in its own. 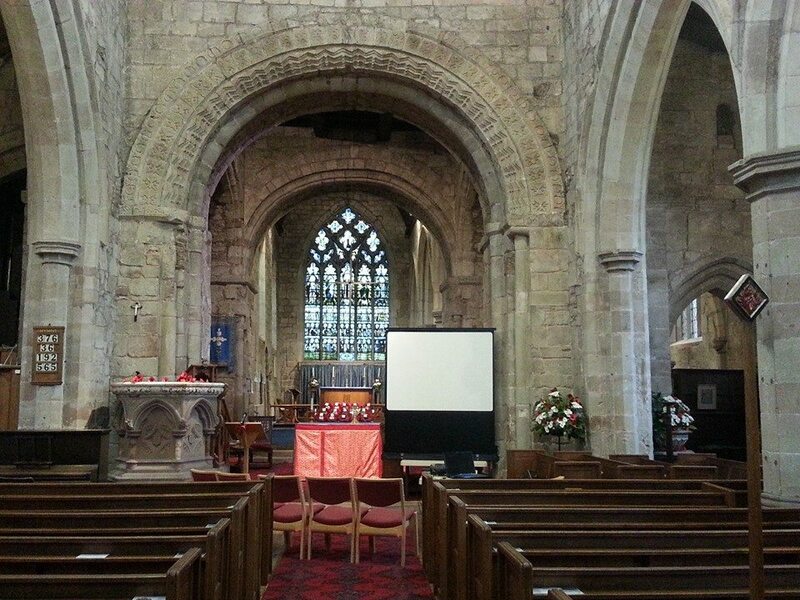 According to Pevsner, the Church of St Lawrence features some of the most exciting Norman work in the county. Here be dragons and other fantastical creatures, Saxon and Scandinavian influences, a green man and other ancient faces. There are no wolves though. Legend has it that the last wolf in Staffordshire was killed here in Gnosall in a pit near Brough Hall and that the effigy in the Lady Chapel is that of its slayer, Baron Brough As much as I wish it were true, there is no evidence for this tale and no reason to believe the Baron ever even existed outside of Gnosall mythology. Several other names have been linked with the alabaster knight over the years, but his true identity remains unknown. 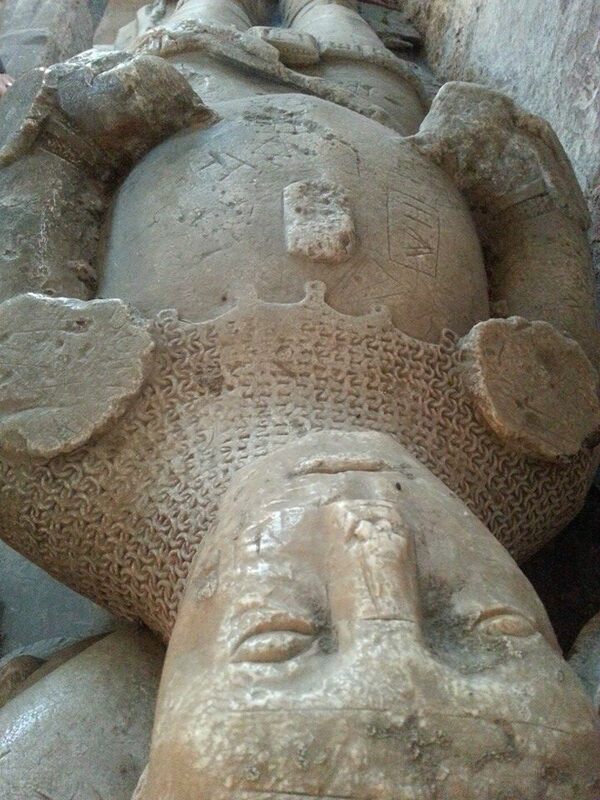 Whilst such personal details are lacking, there is physical detail here in abundance, from the broken angel and the helmet at his head, to the lion at his now missing feet and experts have used these features to date the monument to the early fifteenth century. 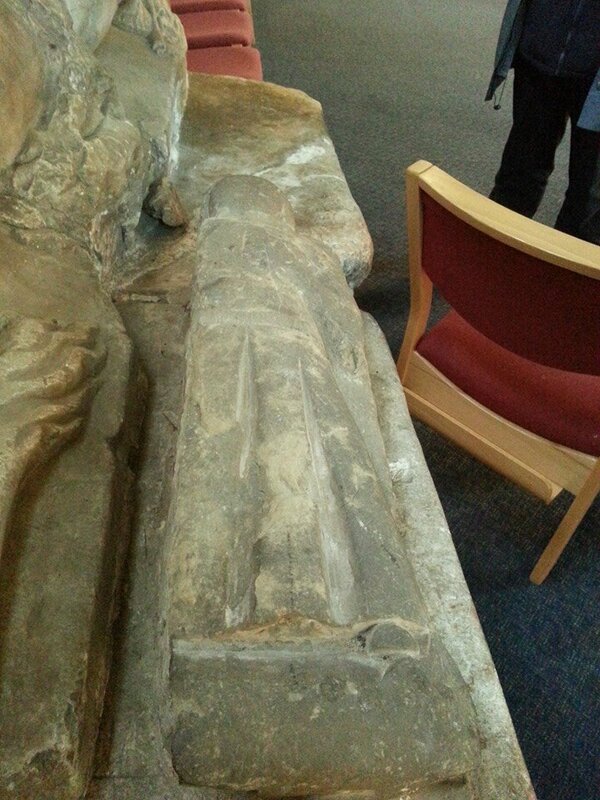 In recent years, the knight has been joined by the church’s only other effigy, taken from the recess on the opposite side of the church known as the Easter Sepulchre. Even less is know about this second effigy, but due to its diminutive stature, it is often described as depicting a child. 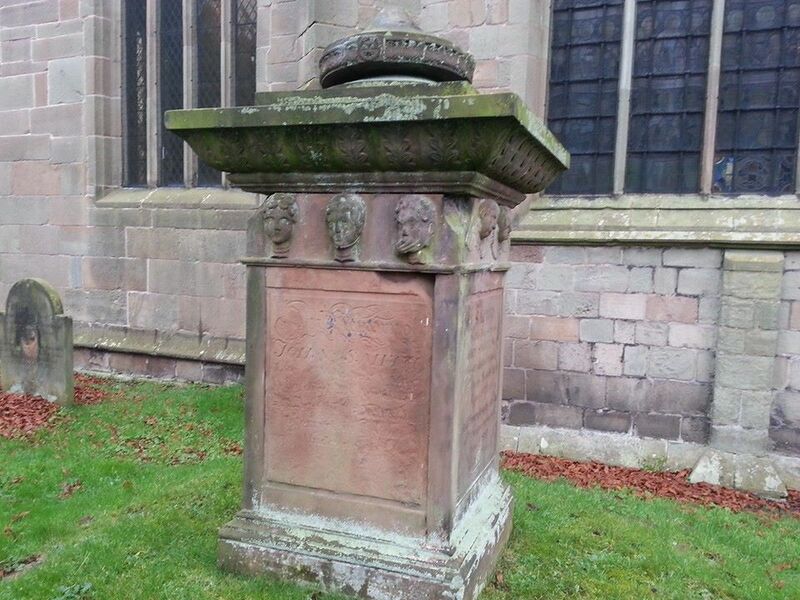 However, after visiting the church, words that I’d read in a paper by Dr Sophie Oosterwijk in relation to the famous Stanley Boy monument at Elford came back into my mind – “A small-sized tomb may deceive the beholder into thinking that it must commemorate a child, but there may be other explanations”. One of Dr Oosterwijk’s other explanations is that these tiny tombs may represent heart burials. 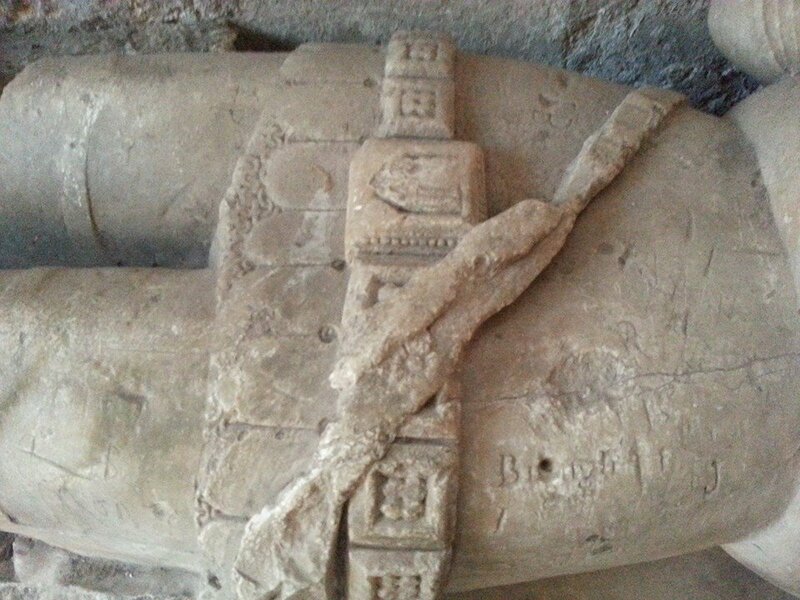 It’s not only the size of the effigy that’s convinced me that someone left their heart here in Gnosall, but also the position of his or her hand over the chest, a feature it has in common with another example thought to be a fourteenth century heart burial at Coberley in Gloucestershire. 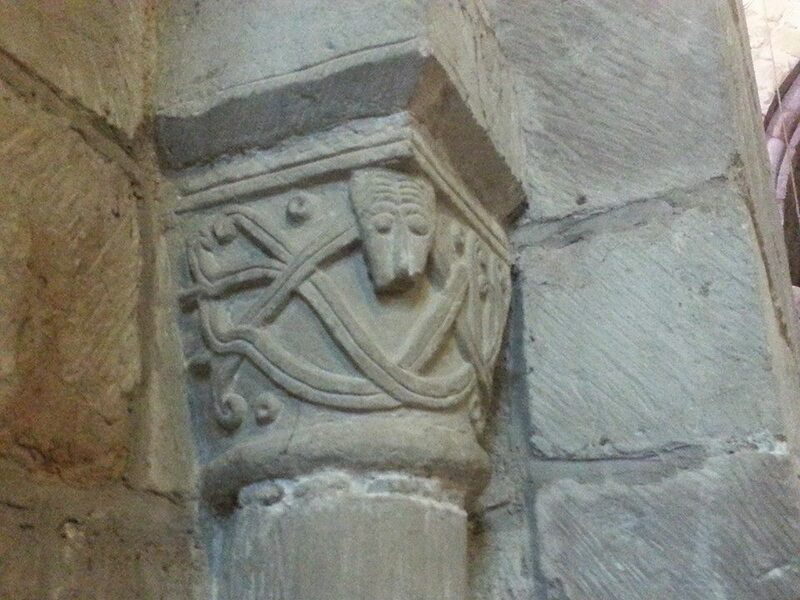 Despite the abundance of surviving Romanesque architecture here, the church is missing its original font. However, at nearby Bradley. and Church Eaton there are examples which date to the twelfth century and recall some of the patterns and themes found at Gnosall, perhaps giving us an idea of what the Norman font at St Lawrence may have looked like. Interestingly, the broken Church Eaton font was reinstated at St Editha’s after apparently being found buried in a garden, and so it’s possible that Gnosall’s is out there somewhere, awaiting discovery under someone’s lawn. 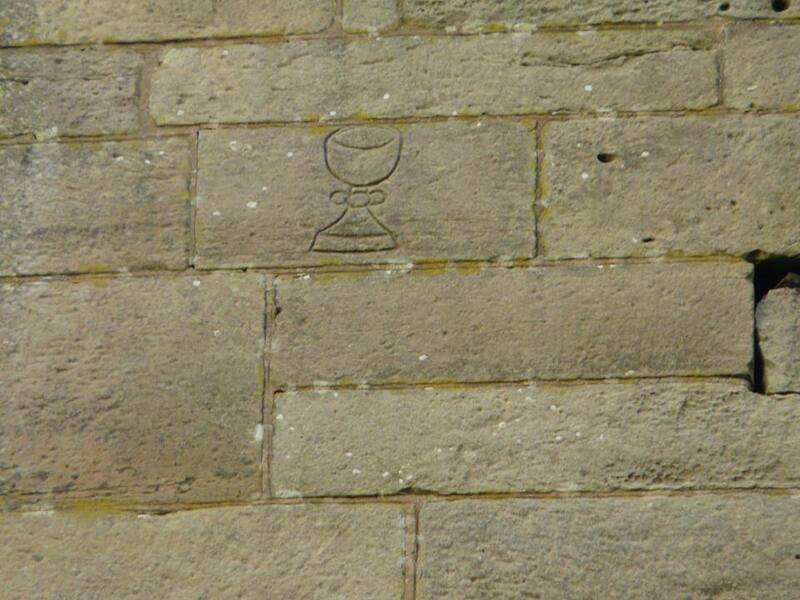 One of Gnosall’s most intriguing features can be found outside, high on the south side of the church where stonemasons (we assume) who extended the tower in the mid fifteenth century have carved a large chalice into the stonework alongside the belfry window. 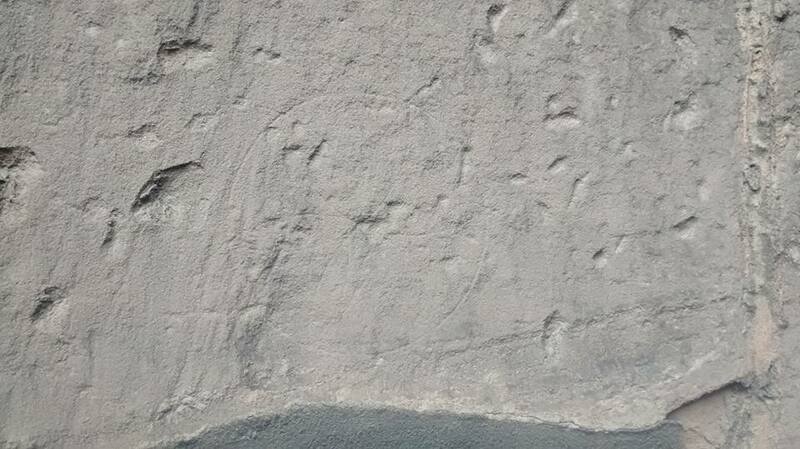 Less mysterious in origin, but still of interest, are the grooves along the wall, said to have been created by the sharpening of arrows when the grounds were used for archery practice. Whether the writer of the verse was interrupted or simply ran out of inspiration is unknown, but we are left to draw our own conclusions on the nature of ‘wimins tongues’. However, when it comes to singing the praises of this incredible building, I shall not be holding mine. 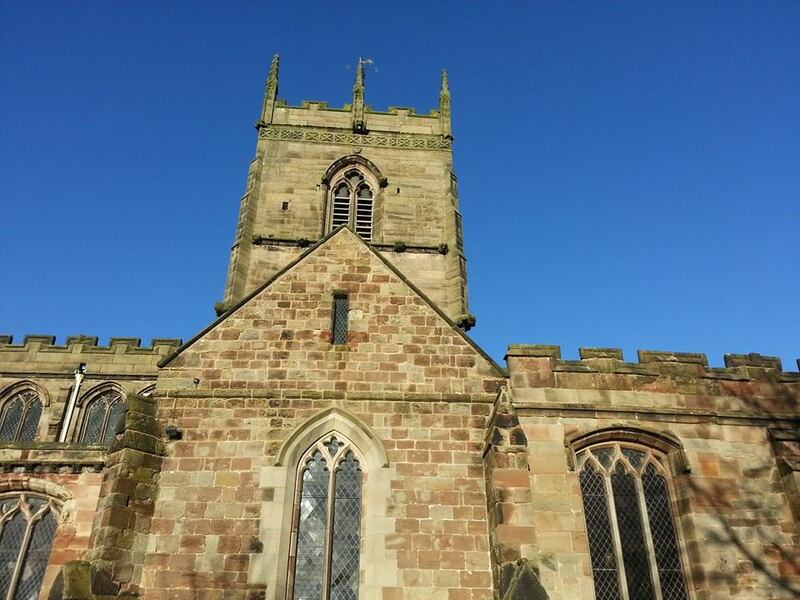 See it for yourself on the weekend of 4th/5th July 2015, when the Church of St Lawrence, including the tower, will be open for tours as part of the G-Fest celebrations held in the village each year. Now that is exciting. With thanks to Norman and Sheila Hailes, for their tour and invaluable knowledge of the church, and to Kathleen Ingram and Cllr Kenneth Ingram and the other residents of Gnosall, for showing us around not once, but twice! Anthony O Wilkinson on What's the Story?